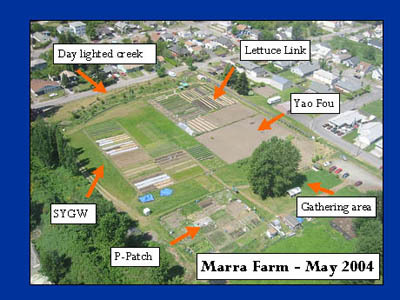 This project in South Park, Seattle reached out to local organizations and the Spanish Speaking Community to establish an active neighborhood-led advisory board for Marra Farm, representing the diversity of South Park. Using a Department of Neighborhoods Small and Simple Grant, the Marra Farm Coalition built a small tool shed with an outside teaching wall, harvesting station & gathering place. It facilitates community building and increases farm functionality. This Marra Farm Community Project built three welcoming entry signs with bilingual signage and two new vegetable wash stations and purchased two picnic tables, an apple cider press and a portable barbeque. These elements create a dynamic and engaging neighborhood hub for gathering, learning and playing.